Download: "HEALTHCARE-ASSOCIATED INFECTIONS BEYOND THE ACA: SUPPLY-CHAIN COULD BE THE KEY TO FURTHER REDUCTION OF INFECTION RATES"
infections (HAI) a top priority. 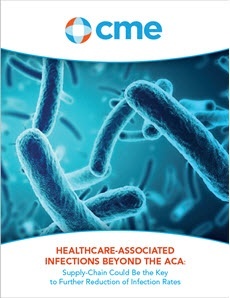 OUR EBOOK: HEALTHCARE-ASSOCIATED INFECTIONS BEYOND THE ACA: SUPPLY-CHAIN COULD BE THE KEY TO FURTHER REDUCTION OF INFECTION RATES WILL PROVIDE INFORMATION ON VARIOUS PRODUCT CATEGORIES THAT COULD HELP STRENGTHEN YOUR CURRENT INFECTION PREVENTION AND CONTROL PLAN. By fostering a partnership between the infection prevention and supply chain teams, HAI can be reduced even further bringing more positive patient outcomes and healthier, happier facilities. Complete the simple form, to the right, to access this eBook now.